That’s right! I make lots of ice cream! Well, I used to, anyway. But no matter how busy or distracted I may get with my new job and new life, when the weather warms up I need frozen treats. One flavor I’d never made or even tried before was black sesame, but after seeing some the other day I knew that had to change. Black sesame is pretty much the most awesomest thing I know of at the moment. Whatcha got there, ice cream? I wanted to make something fun and unique to go with the ice cream, so I whipped out the Flavor Bible and looked up black sesame. Ah, bananas! Of course! I’d been wanting to try a recipe for banana meringues that was in my school recipe book, but we hadn’t actually made. I also really wanted to pipe them into banana shapes. Which I did! I added Chinese 5 spice to the meringues because I have this thing where I’ve decided that 5 spice makes bananas taste more banana-y. Kind of like a mixture of real banana and banana candy. Anyway, they’re really tasty,but the meringue is highly unstable so work with it quickly. Combine the sesame paste and 2Tbsp sugar in a medium bowl, mix to combine thoroughly. Set aside. Heat the 200mL of half & half in a small saucepan over medium heat. Whisk together the yolks, salt and 70g sugar; once the half & half barely comes to a boil, slowly pour it into the yolk mixture, whisking constantly. Return the mixture to the saucepan and cook over medium-low heat, stirring constantly, until it thickens and coats the back of a wooden spoon. Gradually strain it into the paste, whisking it in thoroughly. Chill over an ice bath, then whisk in the 100mL half & half and the ground seeds. Churn in an ice cream maker or by hand, then freeze until hard enough to scoop. Preheat the oven to 200F, or as low as it will go if it doesn’t go to 200. Prepare several baking sheets with silicone liners or parchment. Puree the bananas with the 5 spice thoroughly in a blender. Set aside. Using a stand mixer or electric hand mixer, whip the egg whites to a soapy-looking foam, then gradually add the sugar. Continue whipping until the meringue reaches soft peaks. Very briefly stop whipping and add a few blobs of yellow gel food coloring, or a couple drops of liquid color. Whip to stiff but not dry peaks. Quickly but gently fold in the banana puree, then fill a large piping bag and quickly pipe as kisses, bananas, nests, etc. Bake for at least 30 minutes. Once the outside of the meringues becomes slightly rubbery, turn the oven off and leave the meringues overnight to dry. Store in an airtight container with parchment between layers. The verdict? 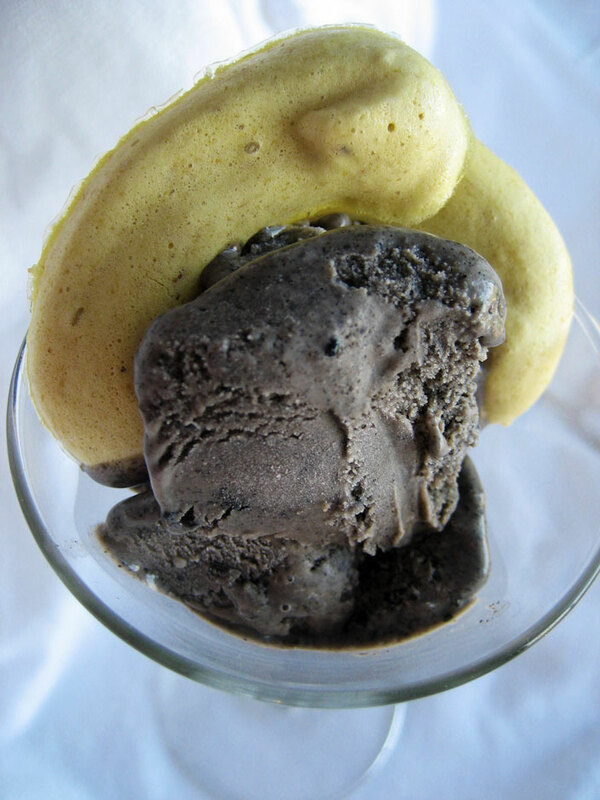 Banana and black sesame are a really kickass combination, one that I plan to play with soon. I need some black sesame flour first, though. And sesame ice cream is amaaaaaazing. My only complaint here is that the recipe makes about a third of what I usually make at once. However, the sesame paste isn’t all that cheap and only comes in small jars, so this is all I could probably afford to make at once anyway. It won’t stop me from going out and getting more paste tomorrow to make another batch, though. This is awesome Anna. 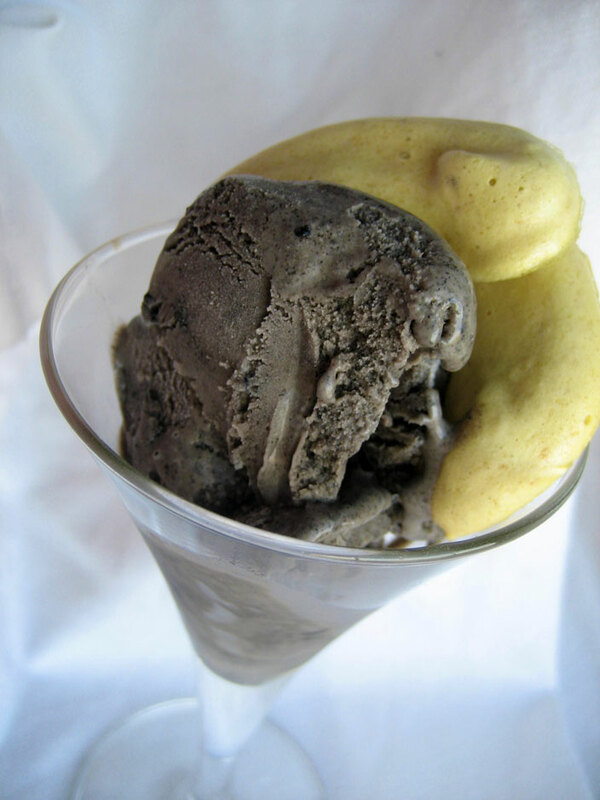 I love black sesame and I love bananas in any form so I will definitely be trying this. this is so unusual, I have to try this. Compliments on your very unique vision of what bananas can be paired with. Yum! 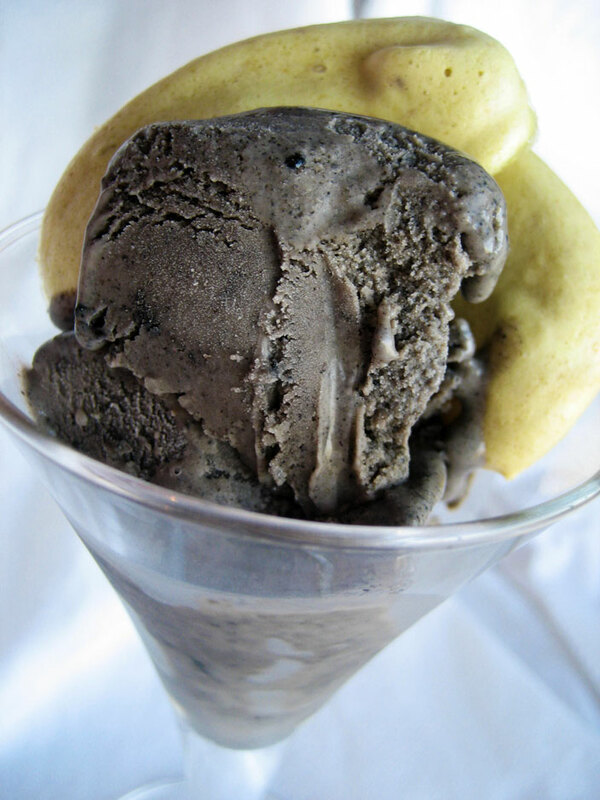 I love black sesame ice cream :D It has such a gorgeous nuttiness to it! And good on you for using real banana for the meringues! You are sooo creative! I love how the banana meringues look like — well — bananas! What a great combo of flavors, too. 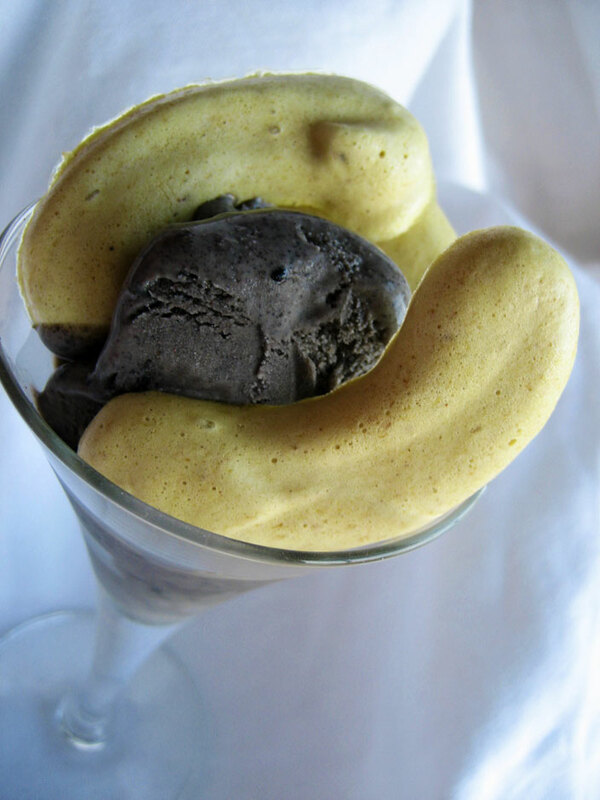 I love it–I guess you could use tahini in the ice cream, but then there wouldn’t be that wonderful color contrast, not to mention the what-the-heck-kind-of-ice-cream is that factor!